Bluegrass lawns generally require 1" or more of water per week, depending on the weather. Most Fort Collins homes, businesses and schools are equipped with electric (advanced) meters. 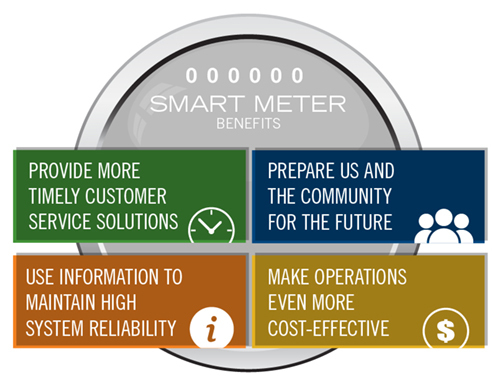 Advanced meters, also known as smart meters or digital meters, provide two-way communication between the meter and Utilities through radio frequency (RF) waves, allowing accurate, timely meter readings and the ability to turn on and off service remotely. Homeowners have access to this data online through the Monitor My Use tool. Utilities is a member of the nationwide Smart Grid Consumer Collaborative (SGCC). Advanced meters pose little to no risk to your privacy and security. Usage data transmitted across the network is encrypted using industry standard processes and technologies. Private customer data is not transmitted to or from the meter. Utilities adheres to strict policies by following state laws that regulate the use of data for business functions like billing and customer service. The City implemented a Cyber Security Plan and is audited by the federal government to ensure all necessary precautions are implemented. All advanced meters are specified, manufactured, installed and accessed by trained and certified engineering and electrical professionals in compliance with industry safety and manufacturing standards, including IEEE, ANSI, and the Federal Communications Commission (FCC). Advanced meters operate at levels much lower than the maximum permissible exposure limits for RF. RF waves are used in many common devices including cell phones, microwaves, wireless routers and even baby monitors. Studies show advanced meters transmit lower levels of RF than many of these devices, and typically, in short bursts throughout the day. Manual Meter Readings - If you prefer to have your meter manually read for a monthly fee, call our Customer Care Division, 970-212-2900. This option must be approved by the property owner.